The idea of coming out this book, was not intentional and pre-planed but writing was choice rather an aim to write an academic book. This book happened to be an opportunity to compile some of work done during my undergraduate. 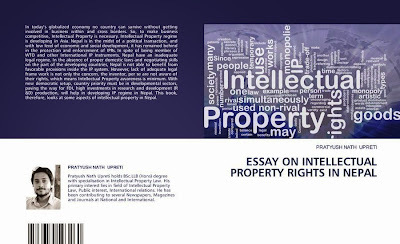 Perhaps, book is written with an aim to aware some aspects of Intellectual Property law. The book is compilation of chapters previously published in Journals during my Bachelor of Science and Bachelor of Laws. The book serve associated audience through four chapters. First part of the book highlights the over all Intellectual Property Regime in Nepal through statically data and literature. Where as, second part gives insight on the Jurisprudential aspects of property, through analyzing several theories of private property rights and fair use doctrine. Third, chapter gives detail overview rights of authorship through dissecting Copyright Legislation of Nepal. Fourth, highlights the issues of celebrity rights, taking example of Namrata Shrestha Incident to shows the existing conflict between media and celebrity rights in Nepal and how would rights of celebrity would be protected through IPR’s. Last, chapter deals with protection of fashion design through IPR’s Legal framework. I hope that the publication of this book will enhance the spread of the IPR’s through the literatures provided in the book.